It seems the relationship between Paramount and its production of Transformers 4 continues to get ever tighter as the studio and Jiaflix Entertainment has signed a deal to feature several Chinese buildings in the film that are owned by Beijing Pangu Investment. In the deal Pangu Investment will provide capital to the movie while the "the company’s flagship building in Beijing, the Pangu Plaza Hotel, being shown in the film. Beijing National Stadium and Beijing National Aquatics Center, the two Beijing Olympics venues standing nearby the hotel, will also be present in the film, according to the announcement." 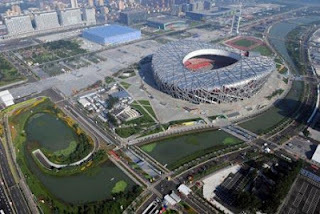 Both Olympic buildings are unique and attractive buildings with American commentators nicknaming the Beijing National Stadium as "The Bird's Nest" due to its exterior design. This deal is in additional to other deals to film scenes in China and Hong Kong and a reality show competition to cast three more Chinese actors in the film. I suspect much more is in the works. If "Jiaflix" makes you think "Netflix" that is exactly what it is. Basically co-owner Sid Ganis is copying the Netflix specifically for the Chinese market and I suspect he is hoping deals like these will help open the doors he needs to get his version to the Chinese masses with a strong slate of videos both from China and elsewhere. It also seems that Paramount and Jiaflix Entertainment's desperate desire to increase ties to China did influence the script as Ganis indicated that "a lot of additional work" was done to the script during pre-production in anticipation of the various deals the two companies were working on. "[Chinese film officials] didn’t say what you have to do, not at all," Ganis explained. "They said to us: ‘Consider who we are as a people and as a government, and when you’re writing the next draft, be mindful of that, please.’ They did not say, ever, that ‘you must do this and that’ – never ever." It will be interesting to see if it pays off in the way Paramount hopes with strong box office sales and more favored status when it comes to scheduling release dates in the country. Until see the movie, its too soon to know if the changes brought on by the various Chinese agreements will have a negative or positive impact on the film. I have to admit I am starting to get concerned it might become a retread of Iron Man 3 where the Chinese influence amounted to a series of commercials. Thanks to Wynton R. for the link. Update: A clarification has been issued on the Jiaflix, TF4 and Pangu deal. It oes not include shooting at the Olympic venues near the hotel but just for the hotel itself. Ganis said, "How this unique building is presented will be entirely up to Michael and his exceptional team. There is nothing in the (Pangu Plaza) agreement that relates to any other facilities or the Transformers 4 storyline." Considering their proximity they will likely appear in the background but not be locations the production films at. I've got the same feeling as you Robert, it indeed seems alot like a retread of Iron man 3 and probably will be. For some stupid buildings. Those stupid olympic buildings are a huge waste of money anyways. Mostly they are to expensive to maintain afterwards. All these Chinese things will probably have nothing to do with the movie and are for advertising only. We still have to see what becomes of this, but I'm also getting a bit concerned. It doesn't sound good. The Pangu Plaza Hotel will get destroyed, according to China.org.cn, obviously it will be with cgi. It says so on ComingSoon.net. I think the others will be destroyed as well. Let's be optimistic...maybe this agreement will keep Bay from shaming the chinese locations the way he did the Great Pyramid with Devastator's balls.